Drone footage shows Lakota standing vigil over her newborn foal. When you live in a mountain wilderness as my wife Laura and I do, you never know what to expect day or night. This seems especially true when living among free-roaming wild horses as we have for these past five years. It was in the pre-dawn light of March 1 that I spied a mare laying down in what seemed an awkward position off in a distant meadow about a quarter mile from our cabin. As I focused the binoculars it was apparent that ‘Lakota’ a big bay mountain mare was in the process of foaling. Her previous three foals were all lost to predators at ages between one month and 14 months of age. And the hard part is we knew and loved them all. And that is some of the price that we pay for the knowledge that we gain by being immersed into our wild horse study, which is truly a lifestyle choice for us. It is a lifestyle filled with amazing insights, love, joy and heartache. The meadow where Lakota was located was sloped at about a 30-degree angle. As I watched, another stallion ‘Blue Boy’ with his mare in tow entered the area above where Lakota and her stallion ‘Andre’ were positioned about 100 yards below. Andre also had a second mare in his harem named ‘Cinda’ who was obviously in estrus. Her scent had drawn Blue Boy to the meadow and the two stallions met to determine who was dominant. Andre being much larger and more powerful easily dissuaded Blue Boy, but, Andre decided he was going to move his mares out of the area. When Andre began ‘snaking’ his two mares, Lakota was still laboring, and when she stood up, the foal fell out onto its head. At this Lakota put her ears back at Andre and spun around threatening to kick him. Andre moved off and instead of moving his mares, decided to instead repel Blue Boy, which he did, sending Blue Boy and his mare back up the hill to the top of the meadow. This reestablished about 100 yards of buffer zone. The new foal was up and seemed to be nursing within 15 to 20 minutes, which was comforting after the nose dive onto the cold, hard ground. At that point, I decided to launch our wildlife observation drone for a closer look. But to launch the drone required about two hours for all the batteries to reach a full charge. By that time, both Lakota and her new foal had moved farther down slope, about 100 yards away. I maneuvered the drone about 100 feet above and off to the side of Lakota and her foal. Because of its size and low noise, the drone looks more like a strange bird or giant dragon-fly. I zoomed in on Lakota and her foal, which from a distance appeared to be napping on its side. But as the magnification increased, I saw something troubling. The new foal’s breathing was very laboured. At this point, three hours after birth, it seemed this foal was fighting to live. But why? 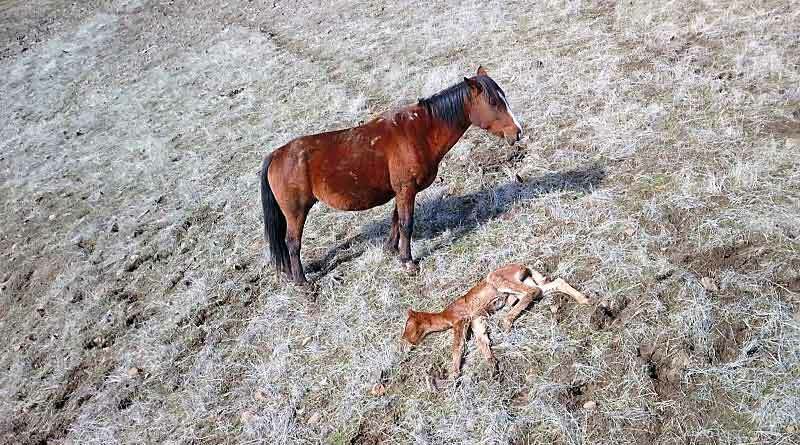 I maneuvered the drone into different positions, yet I could not see any injury or obvious reason for the foal’s distress. Of course any intervention at this point would have been potentially dangerous, and an intervention in the event of some congenital condition would be working against evolutionary natural selection. Somberly, Lakota stood over her foal for about 30 minutes after the foal had ceased breathing. Then, she turned and walked away, leaving the lifeless foal lying in the cold morning sun. I flew the drone back to base, grabbed a camera and jumped on my quad. After a 10-minute ride over the rugged terrain, I arrived at the meadow and parked the quad about 10 yards from the foal. As I walked up, it was clear the foal had passed. Lakota had lost her fourth foal, this one a filly. Sadly, this filly foal only lived for three hours. This little filly died three hours after birth, having sustained a blunt force trauma to her nose and mouth when she fell to the ground. I began an examination of the filly looking for any signs of injury, starting at her head. She had been bleeding from her nostrils and it was now apparent she had suffered a catastrophic blunt force trauma to her nose and mouth when she was dropped, likely hitting one of the many rocks that littered the meadow. The lessons from this event are many; but the simplest one was this: Andre, even with his great physical size, seemed to have made the wrong decision in trying to move his mare as she was foaling. And with four of his own foals lost over the past five years (none of his foals have survived), it seems his genes may not pass into the next generation. Natural selection appears to clearly work against poor strategy and tactics. If Andre had stood his ground, and moved the other stallion off, the foal he sired would have had a better chance of survival. Nevertheless, in balanced ecosystems such as ours, apex predators take a large share of adult and sub-adult wild horses. Over the course of our five-year observation period, only one out of 20 foals born to a live nursing mare survive to their first year, and of those yearlings, only 1 of 5 make it to their second year of life. These low survival rates may also reflect the unusually high density of apex predators (cougars) in this area. So when I see a vibrant adult, I truly appreciate that it has survived some very tough odds. A true in-depth understanding of the behavioral ecology of wild horses can only be obtained by living among them; that much is now clear to me having come to this wilderness with a background in science and livestock production from my formative days ranching on the family ranch in the Applegate Valley in Southern Oregon, where we had several domestic horses. It seems important to recount the fact that about 15,000 to 17,000 years ago, some of North America’s wild horses were able to migrate across the Aleutian land-bridge that existed for a relatively brief period (in geologic time frames) back then, while some horses clearly stayed behind, as evidenced by the fossil record on the North American continent. Survivors: Natural selection appears to clearly work against poor strategy and tactics, says Bill Simpson. Even today we are discovering wild horse fossils dating in the post Ice Age period, with finds dated as recent as 7600 years ago, well after the Ice Age ended about 11,500 years ago. This means that American wild horses did not go extinct during the Ice Age as previously believed by most people and scientists. Moreover, the cultural archaeology of the North American continent also supports that wild horses existed in the pre-Columbus/pre-Spanish period, as posited by Dr Claire Henderson of Laval University in Canada. These and other facts are further explored in this article. Given about five millennia of horse domestication and selective breeding off the North American continent, the genetics of the original North American wild horse species that crossed the Aleutian land bridge was certainly diluted due to selective breeding for breed characteristics, coupled with a significant change in their evolutionary environment off the N. American continent. Meanwhile, as we now see, North American wild horses continued to exist on the north American continent, which is an important fact for many reasons, not the least of which is engaging intelligent management of the remnants of the species on the landscape. The reason for my having digressed to the foregoing is that mankind’s extensive association to domesticated wild horses creates a tendency to make assumptions as to wild horse management based upon an ingrained experience with domestic horses. Even though wild horses and domestic horses appear the same, the behavioral ecology of American wild horses is considerably different from most domestic horse breeds.